Kab Kiska Number Aa Jaye, we really don’t know. First it was our sanskari Bapuji Alok Nath then a couple of week ago it was our Bade Bhaiya Mohnish Behl and this time the Twitterati takes on Delhi CM Arvind Kejriwal and that too in Bollywood style. 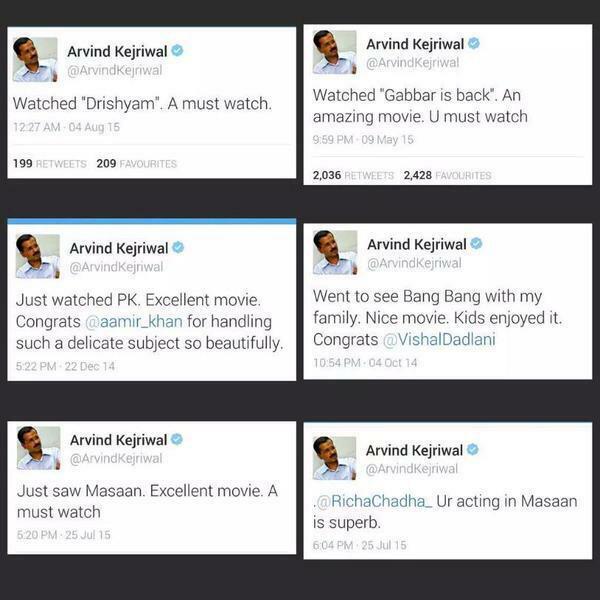 Arvind Kejriwal is a big Bollywood fan and whenever he get a chance to watch a movie, he share his reactions on twitter. Yesterday, after watching Ajay Devgn’s Drishyam, Kejri took to twitter to share his reaction and this is what he tweeted. Watched “Drishyam”. A must watch. As soon as he tweeted this, Twitterati becomes active and started trolling Arvind Kejriwal and that too in Bollywood style. #KejriMovies started trending in India and we have some of the best tweets here just for you guys.